“Being an Army brat and now an Army wife, everywhere is home!” says Jocelyn Velazquez. Daughter of a 20-year Army vet, wife to a 13-year Army NCO and former Ranger instructor, and mother of four — with a fifth on the way — Velazquez is no stranger to the rootless existence of a military family. Though she considers Indiana home, she’s lived with her family in Fountain, Colorado, for the past two years. Before that, they were in Dahlonega, Georgia, and prior to that, she and her husband met in Colorado. Few of us will be surprised to read this experience; we’ve heard it many times from military families. But what we civilians may not consider is one major side effect of the lifestyle: military spouse unemployment. Imagine trying to hold a decent job — let alone build a career — when you move to a new city almost on average every 3 years. And you’re raising your kids alone while your spouse is deployed. And your resume shows inevitable job-hopping, and you have to admit to a potential employer you might not stick around. Unemployment among military spouses is historically two or three times higher than the national average. And when they’re employed, the barriers to career advancement mean military spouses earn much less than other civilians. Thankfully, Velazquez found a unique opportunity for mobile income. 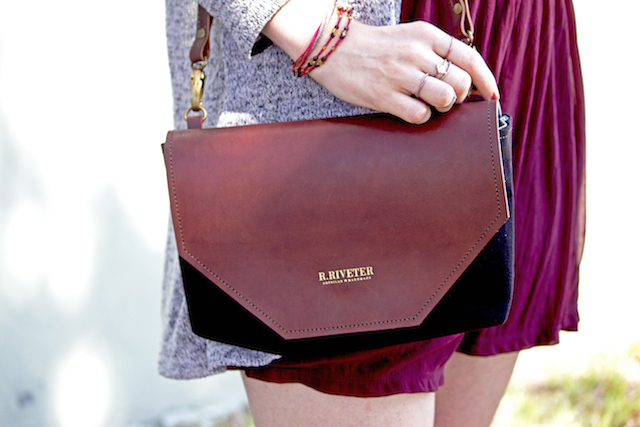 Velazquez has been a contractor with high-end handbag maker R. Riveter since January 2014. Military spouses Lisa Bradley and Cameron Cruse launched R. Riveter from a Georgia attic in 2011. In September 2014, they ran a Kickstarter campaign and raised more than $42,000 — beating their $35,000 goal — for better equipment and a larger space to meet the growing demand for their products. 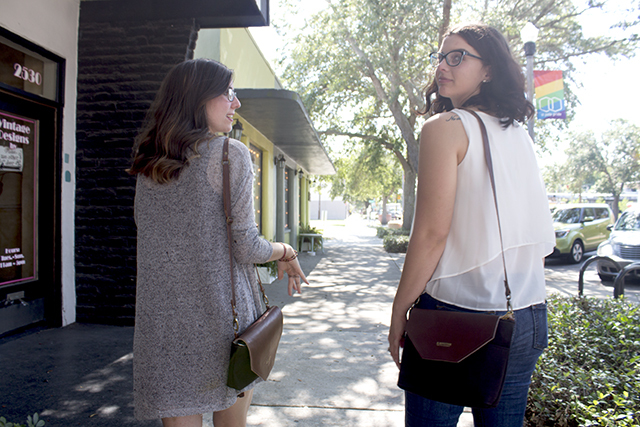 The company’s mission and concept are as elegantly simple as its handbags: Riveters around the country handmake pieces of the bags from recycled military materials and leather, then ship them to a central location for assembly and sale. Remote Riveter employees can sign up for hands-on leather work and basic or industrial sewing, depending on their skills and interest. Velazquez cuts leather, which she says consists of “a lot of stamping.” She also recently started cutting canvas, which makes up the bulk of some bags. Riveter’s contractors are paid per part and varies depending on the specific part, so Velazquez can earn as much or little as she wants based on how much work she puts in. She also has the flexibility to take the job wherever her husband’s position takes their family. Plus she gets the benefit of raising her kids without sacrificing income. The company helps Velazquez and fellow Riveters set up a portable work-at-home business with almost no barrier to entry. R. Riveter sends contractors the materials they need to create pieces. Depending on your existing setup, you may want to purchase some tools to get started. But if you already have a sewing machine, you may be all set! Velazquez has purchased new tools to make her job easier, but she says it wasn’t required. Once you’re up and running, the company offers consistent work. You’ll receive materials and sell back pieces as fast as you can produce them — a huge benefit over other common contract work. The other major benefit is being part of a network of military spouses, says Velazquez. The company promotes this sense of community and pride at every step. 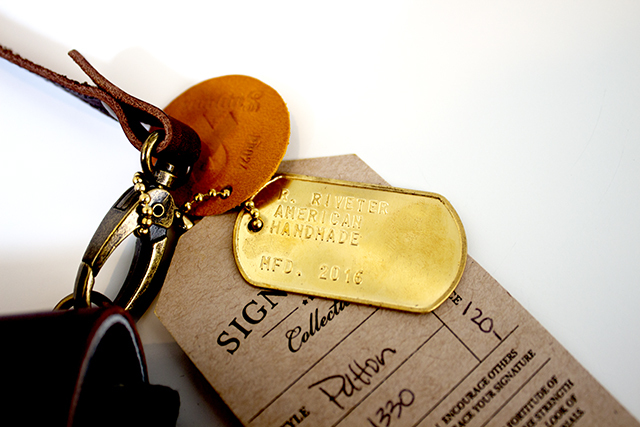 Every piece of every R. Riveter bag comes with the stamp of the contractor who created it, and customers can meet the Riveters on the company’s website. It even includes their locations, so you can see where in the country each piece of a bag comes from! The company also supports military members and spouses by partnering with like-minded non-profit, veteran-owned and military spouse founded organizations. “R. Riveter products represent the humble and courageous spirit of the military spouses we currently empower, and hope to employ with The Sharks,” Cruse told ABC when the company appeared on a military-themed episode of “Shark Tank” in 2016. From their appearance on the show, Cruse and Bradley struck a deal with investor Mark Cuban for $100,000. In less than six months after bringing Cuban on board, the company more than doubled the size of its operation. From 13 Riveters in January 2016, the company grew to 31 by June and made Inc. 5000”s list of the fastest-growing companies in 2017. They updated their flagship store in Southern Pines, North Carolina, and expanded production to keep up with “the Shark Tank Effect” — the wave of business that rolls in after a company appears on the popular show. The company is growing, and its mission is to provide as many military spouses as possible with mobile income. So they’re always accepting applications! If you want to become a Riveter, fill out the application here. Just be patient while you wait for a response. If you’re in the area, they’re also hiring for on-site positions at their Southern Pines FabShop.